Aboard his 22′ AquaSport center console, Captain Butch Barnhill fishes the areas around Boca Grande and Charlotte Harbor. An excellent guide for backwater trips for Redfish, Snook, and Trout, Capt. Barnhill welcomes up to four anglers on his vessel. Butch is happy to serve as your captain for family trips, welcoming children and novice anglers. Butch also is a perfect guide for Tarpon off of the beaches and coastline. Though not a “Pass Guide,” Butch will keep you in the action with tarpon trips that aren’t in the more heavily populated areas within Boca Grande Pass. A long time resident of Arcadia and native Floridan, Butch travels daily to Placida where his boats are docked. He has over 40 years experience with “back country” fishing on light tackle and is glad to share his techniques with you. Having the convenience of being docked in Placida, Capt. Barnhill can either meet you off-island, or can pick you up at the “Pink” docks near Gasparilla Inn, or at Whidden’s Marina on Boca Grande. 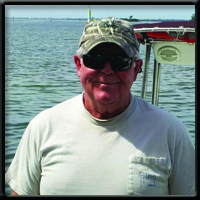 Captain Butch Barnhill consistently receives positive feedback from our clients for his professionalism, laid back attitude, and fishing experience.